Knowing medical school acceptance rates will allow you to accurately gauge your competitiveness for medical school admission. One trend regarding medical school acceptance rates is that they have been steadily decreasing over the past several years because medical school admissions is becoming increasingly more competitive. That said, there is a huge range of medical school acceptance rates. There are many factors that impact medical school acceptance rates including the number of applicants to any given medical school, the number of seats in the medical school first year class, the desirability of a medical school, and whether or not the school is privately or state-funded. 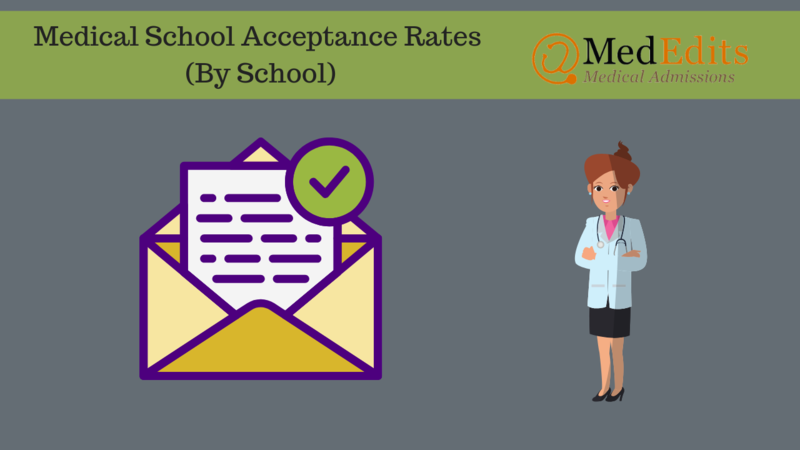 By reading this article, you will learn how to interpret medical school acceptance rates, the lowest and highest medical school acceptance rates, and other admissions data. You will also know how to use this information to your advantage and increase your chances of acceptance to medical school. The average medical school acceptance rate for allopathic medical schools in the United States is 7%. The primary factors that impact this rate for individual medical schools are the overall popularity of the medical school and the number of applications received. For example, a medical school that receives 14,000 applications for 150 first year medical student positions will be more competitive, and have a lower acceptance rate than a medical school of the same caliber that receives only 5,000 medical school applications for 150 first year positions. Geography and prestige also influence medical school acceptance rates. Medical schools in desirable locations, typically urban areas, receive more applications than medical schools in more remote locations. Obviously, a medical school’s prestige or reputation will also influence the acceptance and matriculation rates. The more prestigious medical schools may have an 80% or higher matriculation rate (or “yield”) meaning 80% of accepted students actually matriculate whereas as a less competitive medical school may have only a 40% yield meaning only 40% of accepted students matriculate. Therefore, the medical school with the 40% yield will have a higher acceptance rate than the medical school with the 80% yield because they must accept more applicants to fill their first year class. Acceptance rates between medical schools vary significantly. The most selective medical schools have very low medical school acceptance rates. For example, Mayo and Stanford have acceptance rates around 2%! However, some state medical schools have the highest medical school acceptance rates. For example, the University of North Dakota has an acceptance rate of nearly 18%. Are you applying to medical schools in 2019-2020? Sign up for a FREE 15 minute advising session with an admissions expert. Based on the data available, the average osteopathic medical school acceptance rate was 10.25%. However, not all osteopathic medical schools publish their acceptance rates. Arkansas College of Osteopathic Medicine and Des Moines University College of Osteopathic Medicine have two of the highest medical school acceptance rates at 25 and 16 percent, respectively. In contrast, Rowan University School of Osteopathic Medicine and Western University of Health Sciences College of Osteopathic Medicine of the Pacific had two of the lowest medical school acceptance rates at 6.5 and 6.9 percent respectively. Osteopathic medical school acceptance rates are also declining as more osteopathic medical schools are established. Why? More applicants are applying to both allopathic and osteopathic medical schools at the same time. Nearly 21,000 applicants applied to osteopathic medical school in 2017 and 7,200 students matriculated. What are the most recent allopathic medical school acceptance rates by gender? Osteopathic medical schools do not disclose national acceptance rates. Therefore, we do not know exactly what percentage of applicants are accepted. Also, many osteopathic medical school applicants will preferentially matriculate at allopathic medical schools if accepted to both allopathic and osteopathic medical schools. Therefore, it is likely that higher percentages of both genders were accepted to osteopathic medical schools. Something the osteopathic medical schools do report are matriculation rates. What are the most recent osteopathic medical school matriculation rates by gender? Related Article: How to master the medical school personal statement. There is no question that some races and ethnicities have higher acceptance rates than others. See the table below to review the percent of each group’s overall allopathic medical school acceptance rate. As you can see from the data above, Asians, Native Islander or Other Pacific Islander, Hispanic, Latino or of Spanish Origin, Whites, and Multiple Race/Ethnicity have the highest rates of acceptance. As you can see the most popular majors by far for osteopathic matriculants are the life sciences. First of all, the average GPA for medical school matriculants is 3.72. The average MCAT for medical school matriculants is 511.2. Don’t be stuck on absolute numbers, however, when considering your competitiveness. The average med school GPA and the average med school MCAT mean that many successful applicants had higher and lower than those averages! If you have a lower total GPA, you should try to earn a higher MCAT to compensate for that lower GPA. By the same token, if you have a lower MCAT, a higher GPA will increase your chances of acceptance. For example, students with a GPA in the range of 3.4 – 3.59 have an overall acceptance rate of 32.4. However, students with GPAs in this range who earned an MCAT of 514-517 had acceptance rates of 62.8 percent! The average GPA for osteopathic medical school matriculants was 3.53. The average MCAT score for osteopathic medical school matriculants was 503. Osteopathic medical school matriculants’ post-baccalaureate average GPAs were the highest in history, 3.71. By reviewing the average MCAT scores and GPAs for osteopathic medical school matriculants, we can draw some conclusions. Overall, average GPA for osteopathic medical school matriculants were high. 83.5% of matriculants had a GPA of 3.2 or higher and 45% had a GPA of 3.6 or higher. The more significant piece of data is that nearly 75% of matriculants had an MCAT score of 506 or less. There is simply no way to get around the fact that an applicant’s MCAT score largely determines his or her competitiveness for medical school admissions. Finding accurate data on medical school acceptance rates by college is very difficult. Why? Colleges that write premedical committee letters do not compose a letter automatically on behalf of any student who wants to apply to medical school. If a student is not a competitive medical school applicant, the college may refuse to write a committee letter. Or, the college might agree to only write a committee letter for osteopathic medical school admission and not allopathic. Also, some colleges do not distinguish between allopathic and osteopathic acceptance rates so, the available data may be inclusive of both types of medical schools. However, the medical school feeder college data available is accurate. Generally speaking the more competitive and prestigious the undergraduate college, the higher their acceptance rate for medical schools. Which undergraduate colleges have the most allopathic medical school applicants? The top 10 are listed below. What undergraduate colleges have the most osteopathic medical school applicants? The top 10 are listed below.